“We have a new student joining us,” Pastor Hauptman announced as he escorted a teenage boy, about five feet six inches tall with a head full of dark brown curly hair parted on the right side of his head, into eleventh grade Latin class. “This is Peter Papadakis.” Pastor Hauptman was the principal of Our Savior Lutheran High School and he took great pleasure in introducing the rare new student who registered in the middle of the school year. Peter sat down next to me in the only open seat. “Hi. I’m Ross,” I offered quietly. “Peter,” he replied. He had a very soft accent, probably European of some kind. There was a soft rolling of the “r” in his name. I kept wanting to study him, not the blackboard. Mr. Williams was going through declensions of the irregular verbs in Latin, sum (to be) and eo (to go), writing them out on the blackboard for the first, second and third person, both singular and plural. I diligently copied them down — even though they were in the textbook, because that’s how I learn — all the while sneaking a peak at Peter. He had small lips, the upper one curling up just a little bit and right above it, a faint line of hair that formed a pencil thin mustache. He also had a couple of dark curly chin hairs. There was a beauty mark by the right corner of his mouth and his small nose sloped upward at the tip against his broad face. He had brown eyes, with slight color variations like the back of a turtle. Peter had no notebook, no textbook, not even a pen or pencil. “Do you want some paper and a pen?” I whispered to him. “No thanks,” he replied. Peter seemed perfectly content to sit and listen, and that’s it. Peter got up and pulled a piece of paper from his back pocket, studying it. I leaned over and saw it was a list of his class schedule for the week. He hesitated. “Not sure where to go next?” I asked. Peter handed me the paper and I studied it. He was a junior and he was scheduled for the “B” track. Our Savior was a small high school with around 50 students in each grade level, so the grades were split into two tracks. Peter nodded acknowledgment and headed down the hall. I watched him as he walked. He had slightly bowed legs that made me think of a cowboy. I bet he’d fit nicely on a horse I thought to myself. I didn’t see him the rest of the day. He was a junior, while I was just a freshman. I happened to get an advanced placement into junior level Latin because I had taken 9th and 10th grade levels while in the 7th and 8th grades at my former school. Our schedules were completely different — not even the same lunch period. I was bummed by the realization. The next few days went by with a warped sense of time that went too fast when you didn’t want it to and too slow when you wanted it to go fast. I saw Peter in Latin class only. He never took notes, never volunteered to answer the rare question that Mr. Williams posed to the class. He sat quietly, always to my right, listening. On Friday, as I was leaving school, I saw him standing on the sidewalk, lighting up a cigarette. At first it surprised me, but then it didn’t the more I thought about it. I remember hearing my grandmother being grateful that when she had gone to Europe, almost everyone there smoked. I had tried it a couple of times the summer before, but I didn’t look cool doing it. In fact, I looked stupid so I stopped. My mother had quit years before and my father smoked a pipe. “Okay, I guess. Ross, right?” he said, once again softly rolling the “r in my name. “Then you’re going exactly my way — you’ve got to take the 21 and the change for the 11 at Boston Road, just like I do.” He was the first student from the school who lived anywhere near me. Most of the students lived much closer to the school that I did. Peter lived even further, in Manhattan. We sat down next to each other on the bus, our thighs with the slightest bit of contact. It was a brisk fall day. “Where are you from?” I asked. I was dying to know. “My father’s business. He’s in exports and he needed to be here for a while. He brought me along,” he replied. “I see.” I didn’t know what else to say. “So you live near 181st Street, too?” he asked. The invitation caught me off guard. “Sure. I don’t play very well.” The truth was I had only ever played a couple of times before during my 14 years on the planet. We rode the bus all the way to Manhattan, getting off at St. Nicholas Avenue. It was a short walk and up the stairs to the pool hall that I didn’t know existed. 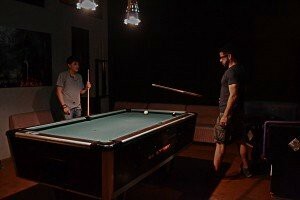 At the top of the stairs, there was a sign that said, “No one under 18 allowed.” I pointed to the sign, but Peter gave me a look that said, “Don’t worry.” The hall had nine pool tables evenly spaced across a large open room. On the walls on both sides were racks of pool cues. There were lamps that hung down so the tables were brightly lit, while the rest of the room was fairly dark. Peter waved to a man standing near the bar. The man waived back. Peter was clearly a regular, despite the age limit. “How old are you?” I asked. I had to know. Peter selected a table near the window and popped a quarter into the slot. When he pushed it in, the balls released into a large opening at one end. He pulled them out, placing them in a triangle. He worked quickly and deftly, seeming to rearrange the balls in a way that I could not completely track. It was clear that he had played pool many times before. “I’ll break,” he said. He pulled out the white cue ball, placing it on an angle at the opposite end from where the balls lay in a perfect triangular formation, the triangle rack having been removed. He hit the cue ball with a forceful stroke of this cue stick, and the balls scattered across the table, one of them going into a near corner pocket. It was striped. “I’ve got stripes,” he said, as he quickly walked around the table, deciding what ball to hit next. I watched him intently, seeing how he placed the fingers of his left hand around the small end of the cue, resting it on his thumb. Peter proceeded to pocket the next three striped balls, leaving only three left when he missed. “You’ve got the solids,” he said. I studied my options for a while, choosing a ball not far from a center pocket. Peter nodded his approval. I did my best imitation of him, but the stick felt clumsy in my hands. I wasn’t sure how to balance the weight properly. He came over and pressing along of me on the left, repositioned the fingers of my left hand and the placement of my right hand on the shaft of the cue. My heart was racing, I was nervous and excited. I lined up the shot and slammed the cue into the cue ball. It hit the red solid ball with the number three on it but the red ball glanced off the lip of the pocket. It was Peter’s turn. He proceeded to pocket the next two striped balls, so he had only one left. “You go. I don’t want the game to end so fast.” He handed me the cue. “Don’t angle it so high, hold it lower.” He again edged up close to me, adjusting my angle as I held the cue. His hand brushed up against mine. I caught my breath, hoping that he wouldn’t notice. I aimed to hit the red ball again, this time for a corner pocket. Success! I jumped up and down. “I did it,” I exclaimed. We played pool for hours. I completely lost track of time. There were no wall clocks in the hall. Finally, it was getting dark, and it was clear it was suppertime and I needed to get home. I thanked him for the lesson and left the hall, gliding down stairs I couldn’t feel to the street and down the block to the bus stop. Playing pool became our Friday routine after school. Peter didn’t talk much. He was quiet, thinking thoughts that he would not share with me. He seemed to like the quiet, so I had to work hard not to talk too much. He wasn’t interested in talking about school or any of the students. He talked about his mother. He missed her. He missed her cooking, too. He did not care for American cuisine. He ended up preparing his own meals, as it was just him and his father. Occasionally, he would remark about how pretty a girl was, but he never approached any girl who happened to be in the pool hall, at least not while I was with him. He never flirted with the girls at school either. He focused on the game, and on teaching me. At first, Peter was the big brother I never had. My father was an elementary art school teacher who knew nothing about sports or games except swimming and Monopoly. Peter didn’t know anything about American sports. He liked soccer, or as he called it, real football. Many of his shirts were replica jerseys from various European teams. Being kind of a geek at school, I was teased and made fun of a lot. Nobody messed with Peter. I never heard anyone talk about him when he was not around. He had this air of quiet, almost dangerous, confidence that made people think twice about testing him. It didn’t matter one iota that he wasn’t tall. Despite being bright and somewhat nerdy, I enjoyed gym class. I played basketball, volleyball and in the spring, softball at a nearby park. I liked to run and joined the track club. The coach was our science teacher, Mr. Osterman. He taught me how to run hurdles. We had track practice every Saturday morning, but I looked forward to Fridays more than anything. Peter was so kind and attentive towards me, and yet we were so different. His passion for the game of pool was attractive. I felt so lucky that he wanted to share it with me. In Latin class, we had finally gotten past verbs and started vocabulary and grammar. In my textbook, I came across the word petrus, which meant “rock.” It instantly became my secret nickname for Peter. A couple of times I caught myself before I called him by that name. He was Greek after all, and the Greeks and the Romans were enemies for over a thousand years. I didn’t want to offend him. I was also a little — no, a lot embarrassed because I had a crush on him. I didn’t think he liked me in that way, and I didn’t want a bad reaction, although, to be honest, I wasn’t entirely sure he would have a bad reaction. I wanted to kiss him so badly but I didn’t want to mess up the friendship we had, so I kept my feelings to myself. One day in late winter, Peter did not show up for school. I asked the secretary the school office if he was okay. I was crushed. I had no way to contact him. He would never give me his phone number. He didn’t offer and I didn’t ask. Even after all that time playing pool together, he never once invited me home to meet his father. I began to think he lived at the pool hall. That day after school, I went to the pool hall to try to find him. I walked all around but he wasn’t there. I waited for a couple of hours, but he didn’t show. I walked all around the streets that surrounded 181st Street. I went into all of the stores. I couldn’t find him. I sunk into a dark, lost mental plane. The neighbors were throwing a party — they were really my sister’s friends, not mine. She could see that I was down. I went. I got talked into taking a couple of hits off a joint. I had only done it once before. It did help me feel a little better, at least for a few hours. The next day I was even more depressed. Just like that, Peter was gone. No goodbye. I was left with so many unanswered questions. I wondered if he knew how much I had come to like him. I tried out. About 20 boys showed up to tryout for 12 spots. Later I found out that the size of the team was based on the size of the school van. I was tall for a 14 year old, but I could run, and I made the team. Every game, I just wanted to make Petrus proud, wherever he was. I am a produced playwright, an actor, singer, director, producer whose forte is comedy, love and relationships, LGBTQ and health issues.